I love books! In this very digital space, I have often written about books and bookstores. I’ve also written about people who write books, articles, poetry, movie and TV scripts, as well as blogs; we call them Authors. The people were so kind and generous with their time, insight, and perspective; even if you didn’t buy their books (which I bought many….another blog). It was also so exciting when I did buy their book and they asked my name and signed it personally. That’s what authors at Expos do. I have bought many books as gifts for other people. I often inscribe the inside cover. It would be to convey this message; I love what this author has written, or what this artist has portrayed, and I give this book to you in the hope that you love it too. In my opinion, these are the only two times anyone would “sign” a book. Recently, ‘Individual One” had flown on Air Force One to the state of Alabama so he could allegedly view recent tornado damage the area suffered. Well, before anyone had a chance to pitch a tent and fire up Brother Love’s Traveling Salvation Show, “Individual 1” was front and center signing Bibles. That’s right; signing Bibles. I have decided to treat the whole situation as if I was at the book expo and wanted to interview an author with some questions about their book. Let’s get started with our top 5 questions. Individual 1. “As you know, I’m a very stable genius who has tons of “executive time” which mean I do nothing all day but watch Fox and Friends, so I have plenty of time to write-up books over thousands of years. 2. Zulu Delta– “One of the characters in your book; Jesus, is said to be “the very first socialist.” You bad mouth socialism all the time. Individual 1. “Jesus….I barely know the guy. He was a low-level coffee boy. I just used him as a front man to whip up my Evangelic crowd before any of my campaign rallies. 3. Zulu Delta –Jesus spoke often about charity. What do you think? Individual 1-“Absolutely!! I definitely advise all corrupt people to start-up their own charity; it’s so easy to launder money and treat the donation as your own personal piggy bank. 4. Zulu Delta– The vast amount of material in the Bible was selected, and or reduced down by the “Elders” at the Council of Nicaea in 325 A.D. Were you there? 5, Zulu Delta– What’s your favorite bible verse you wrote? “If one looks back through the history of printing, many of the most lavish and ambitious projects have been Bibles in which the world’s greatest typographers, printers, and illustrators have allied to create a work of art worthy of a sacred text. Despite this rich tradition, the twentieth century has witnessed no major Bible in which both the New and Old Testaments were illustrated by a single artist. As we neared the end of the millennium, one of the world’s greatest living illustrators and bookmen focused his efforts on the book which has made the greatest impact on Western civilization. 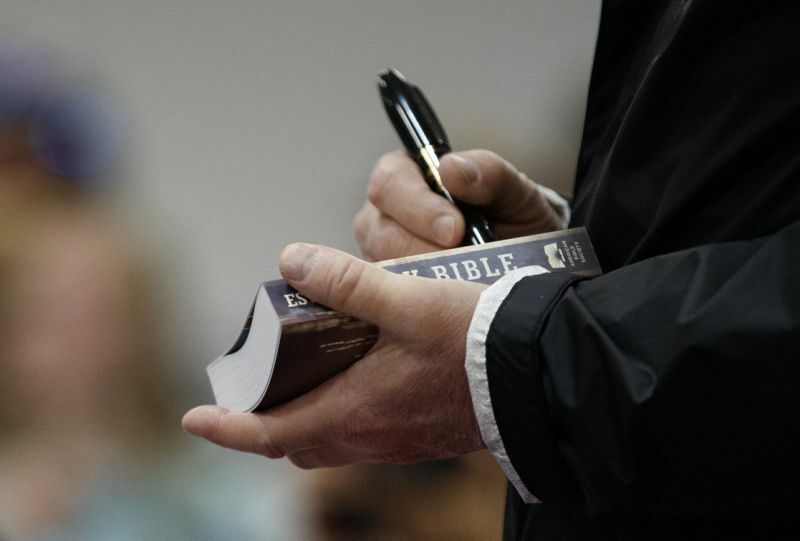 I don’t want to get political, but any politician who signs a Bible… that has got to be the pinnacle of arrogance. And meanwhile the Pope is trying to end the practice of people kissing his ring. Thanks for the comment J.S.! Both practices need to go! Trump signing bibles is like a vegan working in a butcher shop. Oh….was that Trump in that picture?? Heheheh! I had no idea that this happened…so crass of him. Good interview…fun to read, and I can imagine those answers coming from him. Who were we talking about??? Wink-wink-nudge, nudge! Heheheheh! This SERIOUSLY cracked me up. I’m totally sharing this. I’m still giggling. Thanks! Humor may be all we have left! Of course, this is a highly disturbing post. But one of your more creative and hilarious ones! !